Industry groups said that the result vindicated what they have been arguing for years: drilling activity has risks, but fracking doesnt deserve new federal oversight. It was always a longshot that the Obama administration or Congress would crack down on the golden goose of hydraulic fracturing. The chances shrunk further Thursday with the release of a landmark U.S. Environmental Protection Agency study that found the drilling method had no widespread impact on drinking water. “That is as close as the federal government gets to saying, ‘I’m not that interested in you,’” said Michael McKenna, a pollster and lobbyist close to Republican lawmakers. Fracking has helped bring about a boom in U.S. oil and gas production, turning the world’s largest hydrocarbon user into its largest producer. With that boom have come complaints that it’s fouled water supplies, polluted the air and even triggered earthquakes. Some communities and states have responded by banning fracking, in which millions of gallons of water mixed with sand and chemicals are forced underground to free natural gas or oil. 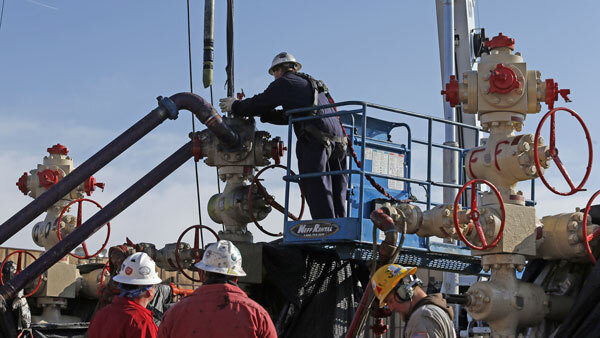 Environmental groups have urged Congress to strip a 2005 exemption of fracking from drinking water laws and asked the EPA to tighten rules on disclosure of the chemicals used and limits on the methane emitted. “The EPA fracking study does not appear likely to spur additional federal water regulation beyond initiatives that are already in process,” Kevin Book, an analyst at ClearView Energy Partners, said in a research note. That’s good news for companies such as Halliburton Co. and Schlumberger Ltd., the largest oil services companies, as well as producers Exxon Mobil Corp. and Chesapeake Energy Corp., as they weather a drop in oil and natural gas prices. Industry groups said that result vindicated what they have been arguing for years: drilling activity has risks, but fracking doesn’t deserve new federal oversight because the risks of underground water contamination is low. The study “is absolutely consistent with all the previous studies that show that effective well containment practices make hydraulic fracturing a very safe practice,” Alan Jeffers, a spokesman for Exxon, said in a telephone interview Thursday. The report’s conclusions don’t provide any support for fracking regulations proposed by congressional Democrats, said Larry Nettles, a partner with law firm Vinson & Elkins who represents several industry clients that supplied data for the study. “I think this report effectively kills those bills,” Nettles said. The report is also a boost for President Barack Obama’s reliance on natural gas to achieve cuts in greenhouse-gas emissions from power plants, an effort that’s the mainstay of his agenda to combat climate change. The Obama administration in March issued fracking regulations for drilling on public land, requiring drillers to reveal the chemicals they use and to meet construction standards for wells. Most of oil and natural gas production, however, occurs on private lands and isn’t affected by the rule. Stanford University professor Rob Jackson has tested water supplies in communities where residents said they had contaminated supplies, and found there are risks from the process but not insurmountable ones. The EPA study doesn’t add much to that and other on-the-ground research, he said. The EPA could never come to terms with gas producers such as Range Resources Corp. or Chesapeake Energy to conduct water tests near where wells were to be drilled and fracked, and then go back and re-test afterward. Without that baseline data, the EPA said it’s hard to tell if fracking is the cause in instances of alleged contamination. In addition, when the study began much of the focus was on the risk that chemicals mixed in fracking fluids could flow through underground fissures and into underground water reservoirs. The results show that might not be the biggest risk. And the biggest worry now about fracking, is one that has nothing to do with the process itself. Residents in Oklahoma, Ohio and other states have seen more and more earthquakes, which researchers tied to the increasing use of disposal wells for the wastewater from fracking. “The water quality issue is not the primary problem with fracking impacts, it’s seismicity,” said Paul Bledsoe, president of Bledsoe & Associates, a strategic policy firm, and a former aide to President Bill Clinton. –With assistance from Bradley Olson in Houston.